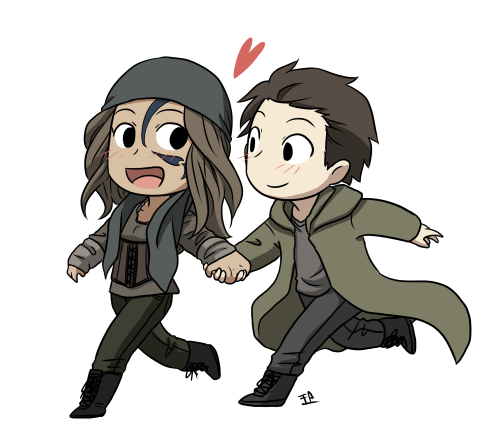 Fan Forum > TV Shows - Present > The 100 > Outcasts | Murphy 💘 Emori | #4: Their love has reached new heights... in space! Outcasts | Murphy 💘 Emori | #4: Their love has reached new heights... in space! "Personally I love Memori because their love is so light. Just seeing them together smiling is extremely infectious. I never thought that Murphy would develop a relationship like this until Emori showed up. someone come in with a different perspective and open mind was almost emotionally lifting. Emori gets being the outcast, and I think that's what does it for me. "You're cute for a thief." "Because they have the cutest ship name ever." "You let her go right now." "I'll do whatever it takes to be the mistake you can't live without." "You're the only light that's breaking through the window." “You’re not the only one here trying to save someone you care about." Vote for your least favorite scene. The first scene to receive five votes or the one with the most votes after 72 hours will be eliminated. Emori: I'm so sorry, John. Murphy: It's okay. It's okay. Emori: A good randzi is rare. John would be celebrated by any clan. Clarke: Yeah, he’s a real catch. Emori: John, enough. You can’t stop this. John: No. No, Emori I’m not letting this happen to you. Emori: John, listen to me. Make them think you’re okay with this. We make Clarke think you’re still with her. Emori: No. Damn it, John. Think! Don’t give them a reason to pick you next. Survive, please. Emori: They’re not coming back, John. Murphy: So we go to Polis ourselves. Emori: The boat’s on the wrong side of the water. We’ll never make it. Murphy: Then I guess we ride out the storm in the lighthouse bunker. Emori: For five years? We’ll starve. Murphy: Who needs food when you have love, right? Murphy: Hey, did they hurt you? Emori: I heard the warriors talking. There’s only room for a hundred Arkadians in this bunker. Emori: It felt good to be safe. I never felt that way before. Like I had a home. Murphy: Hey, your home is with me, okay. Murphy: Fifteen percent, that’s ten minutes of air left. Murphy: That’s good. At least I don’t have to watch you die. TFTNT, Marie! Adorable title. And thanks for brining the Survivor over. This is a nice OP. The 3x05 kiss may not win the Survivor (the way I wanted it to, tbh), but at least it's in the OP! Thanks Marie! Cool title too. TFTNT! Title is really cute. I can be okay with that plan, Marie. Yes, we need Paula. Paullllllaaaa? Stella? The Stella gif can work wonders! If I switch to #19, will any of you vote #15 next time? I meant people who had voted for #19 this time.